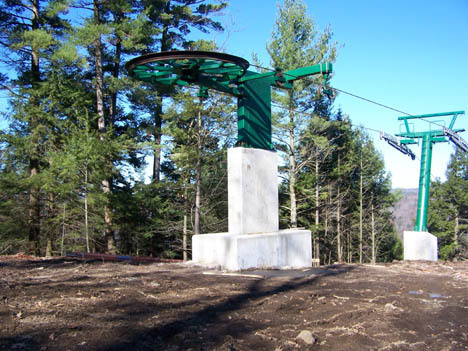 Granite Gorge is the reincarnation of the former Pinnacle Ski Area that operated in Keene NH. NELSAP is very excited that this area has reopened, as the original Pinnacle had closed in 1977! This makes Granite Gorge, which reopened in 2003, as perhaps the longest lost area to come back. Please visit the area at http://www.granitegorge.com. 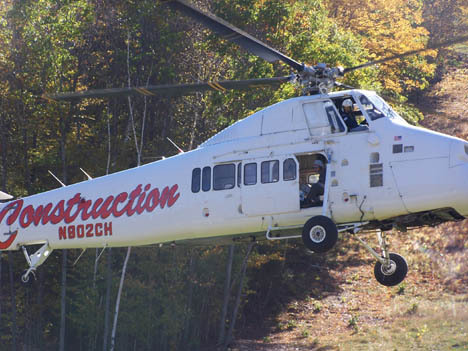 Fred and John Baybutt, of Baybutt Construction Corporation bought the land in 1999, worked on the mountain, and reopened it for the 2003-2004 season. During that season, just a beginner handle tow and a tubing area operated, along with a new lodge. This operation continued into the 2004-2005 season. During the summer of 2005, massive operations took place on the mountain, with a refurbished double chair built to the summit, along with many cleared trails, increased snowmaking. The winter of 2005-2006 will be the area's first operation as a full base to summit area. 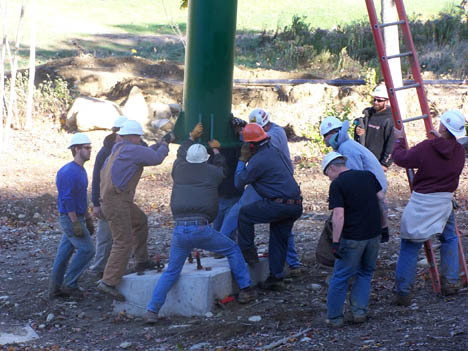 Below is a lot more information from Fred, along with pictures from fall 2005 of the double being installed. We grew up skiing at Pinnacle Mountain here in Keene & Roxbury, NH. This really is the thrust of why we embarked on this odyssey. To return skiing and riding to all the youth (and parents) of this area without having to drive an hour to get to the mountain. Our goal is also to be affordable and provide "something for everyone". We now have 12km of groomed cross country, a separate 5km snowshoe trail, a beautiful tubing park with NH's first & only Wondercarpet served tubing, and skiing and riding. A very nice thing is, to head up our mountain management team, we have been able to bring back Chip Woodbury, Director of Ski Operations, and Klaus Bayr, Ski School Director, to the same positions they had at Pinnacle! We have bridged the past to the present. Equipment for the new double. Power supply for the new lift. After purchasing the land in 1999, we conducted feasibility studies and engineering master plans with SnoEngineering, Alford Engineering, Clough Harbor & Associates and Frederick A Farrar. I must say, at every step of the way, and even more so today, the mountain has exceeded my expectations! To digress a bit, in the late 1950's a special winter facilities development committee was created by the state legislature. The committee, that included former Olympian Charles Tremblay, and worked closely with Sheldon Hannah, was formed to locate the ideal "gateway ski area" for southern, NH. At the time, the State was upset that VT & NY were attracting the lions share of skiers and developing new areas/lift capacity at a much higher rate than NH. The Committee selected Mount Monadnock in Dublin as their first choice. The "Dublinites" would have no part of developing Monadnock so the committee unanimously agreed to move forward with their second choice of Pinnacle Mountain in Keene & Roxbury, NH right on Route 9. 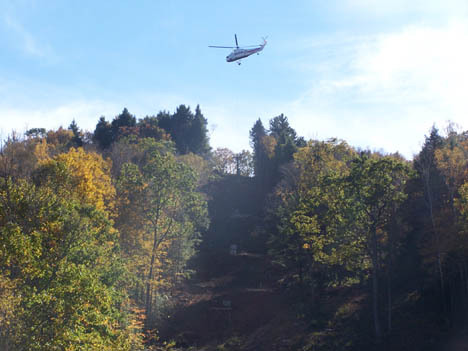 Helicopters were used to fly in towers. Lowering a lift tower in place. The Committee selected Pinnacle Mountain for its location, protection from the wind, its North Face and ability to hold snow. Pinnacle Mountain Ski Area opened in 1960 and was a favorite local area until it closed in 1977. With all local, state and federal permits in hand, we have now installed a powerful snowmaking system as the heart of the mountain and opened for the winter of 2003/2004 with one brand new 600' O'Connor handle tow for tubing, skiing and riding on the "Bunny Buster" trail. (We retained all the old trail names from the original area). Here are some details regarding the new/retro chairlift: The lift is a 1981 Borvig and came from Devil's Elbow ski area in Bethany, Ontario. It was like adopting a child as it had to fit our profile. I must say, John Holmberg, owner, runs an immaculate operation and the lift was just taken out of service and is in excellent shape. 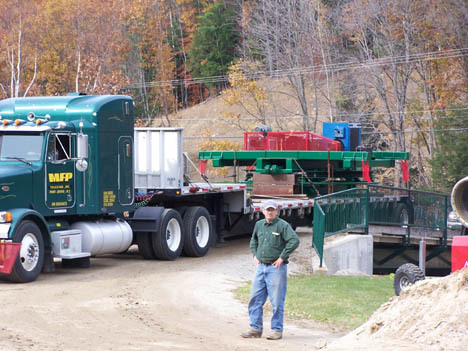 All the towers were shipped from Canada and refabricated to meet Ross’ specs and re-painted our “Granite Gorge Green”. Flying in more towers. Note the steepness of the liftline trail. 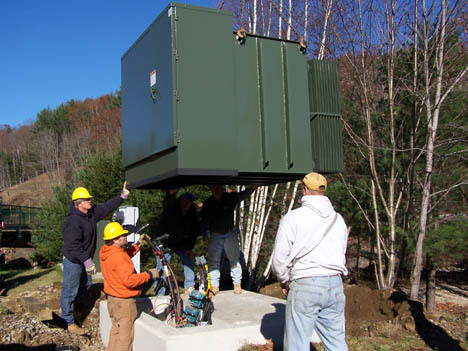 The lift will feature a mid station unloading capability with a new depress tower and numerous brand new sheave assemblies. We have gone through all the sheaves, packed new bearings, replaced all liners and greased and painted green. All new Grade eight bolts have been installed for connection to towers. The towers have all been fitted with brand new catwalks and lifting frames. All the lift towers are in. At the base is the mighty Otter Brook. Our first order of business was to design/permit and install a new 65' span bridge over the river. Once completed, we literally cleaned everything off the mountain for a year. Lifts included a T-bar, Pomma and a rope tow all dropped and abandoned. Buildings included the old lodge, maintenance building, utility building and Chalet. Many local fire departments participated in a controlled burn of the Chalet for training. The idea was to start with an absolutely clean slate. Everything we have installed is brand new and we know what we bought and can depend on it. Our area has three groomers. 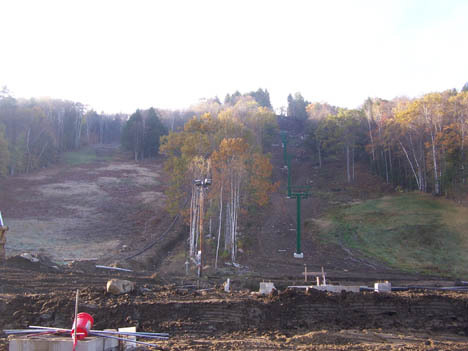 The new 1500' base to summit chair will open up skiing & riding on 17 beautiful and diverse trails. Some trails are quite steep. You can check out the new trail map at www.granitegorge.com. And the newest trail map. Notice the wide variety of trails and slopes, some of which area quite steep! The most satisfying part of this area rebirth is the sense of pride people in our region have taken in having their own area again. Keene is a growing City and is at the heart of the Monadnock Region. Jimmy Cochran is from Keene and is skiing on the US World Cup team. Please come out and support this great community area this winter!